Londonderry’s innovative cultural hub the Nerve Centre is facing potentially devastating cut of up to half of its funding. It is the result of proposed cuts to Northern Ireland Screen’s budget. The Centre says the proposed 50% cuts will devastate Northern Ireland’s three Creative Learning Centres (CLCs) in Derry~Londonderry, Belfast and Armagh, and the Nerve Centre’s hugely popular Foyle Film Festival, INTO Film Clubs and Film Education programmes. Last year, almost 7,000 young people and more than 5,000 teachers received training in digital skills including film, music, coding and animation through the Creative Learning Centres; more than 2,800 young people attended after-school film clubs at 118 schools; and 6,000 film-goers and young people enjoyed the Foyle Film Festival, Northern Ireland’s only Oscar®-affiliated film festival. Pearse Moore, chief executive of the Nerve Centre, said: “These cuts will have a devastating impact. The CLCs are giving young people the digital skills needed for a 21st century workforce, including some of the most marginalized young people in our society. Nerve Centre film programmes are also changing lives for the better though the power of film. 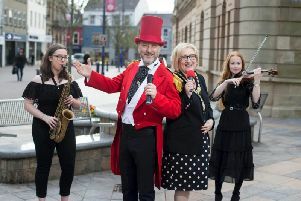 The Department of Culture, Arts and Leisure (DCAL) has asked Northern Ireland Screen to prepare for cuts to its budget next year from £1.9m to £1m. The proposed cuts will also affect other organisations including Cinemagic, Belfast Film Festival, the Queen’s Film Theatre, and CultureTECH. The Nerve Centre and the CLCs have started a campaign against the cuts and are asking the public and users of their services to send objections via www.nervecentre.org or direct to DCAL on budgetconsultation@dcalni.gov.uk.